Announced last year, John Mattos's 2012 cycling stamps for the United States Postal Service can be purchased starting June 7. 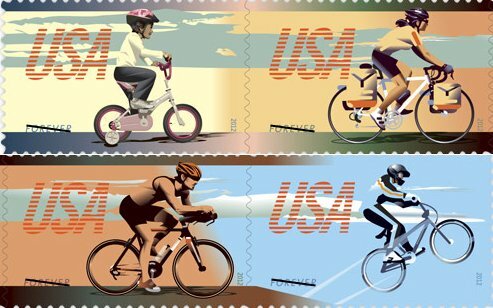 This set of forever stamps celebrates one of the most popular sports and past times in the world and represents different kinds of bicycle riders, from the child just learning, to the pro racer. John worked with art director Phil Jordan to create these great illustrations.